We think of medical science and doctors as focused on treating conditions—whether it’s a cough or an aching back. But the sicknesses and complaints that cause us to seek medical attention actually have deeper origins than the superficial germs and behaviors we regularly fault. 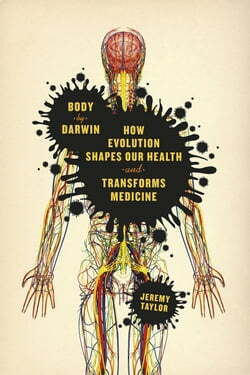 In fact, as Jeremy... read more Taylor shows in Body by Darwin, we can trace the roots of many medical conditions through our evolutionary history, revealing what has made us susceptible to certain illnesses and ailments over time and how we can use that knowledge to help us treat or prevent problems in the future. In Body by Darwin, Taylor examines the evolutionary origins of some of our most common and serious health issues. To begin, he looks at the hygiene hypothesis, which argues that our obsession with anti-bacterial cleanliness, particularly at a young age, may be making us more vulnerable to autoimmune and allergic diseases. He also discusses diseases of the eye, the medical consequences of bipedalism as they relate to all those aches and pains in our backs and knees, the rise of Alzheimer’s disease, and how cancers become so malignant that they kill us despite the toxic chemotherapy we throw at them. Taylor explains why it helps to think about heart disease in relation to the demands of an ever-growing, dense, muscular pump that requires increasing amounts of nutrients, and he discusses how walking upright and giving birth to ever larger babies led to a problematic compromise in the design of the female spine and pelvis. Throughout, he not only explores the impact of evolution on human form and function, but he integrates science with stories from actual patients and doctors, closely examining the implications for our health. As Taylor shows, evolutionary medicine allows us think about the human body and its adaptations in a completely new and productive way. By exploring how our body’s performance is shaped by its past, Body by Darwin draws powerful connections between our ancient human history and the future of potential medical advances that can harness this knowledge.